By profession a dedicated newspaperman and sportswriter, Charles Einstein also dabbled in writing mystery and crime fiction. He died last week, and a more fitting and heartfelt tribute to him could not be found anywhere than this one by crime writer Wallace Stroby, who was also his editor at The Newark Star-Ledger for several years, not to mention a very close friend. �His father was Harry Einstein, a radio, vaudeville and film comedian who billed himself as �Parkyakarkus� and was a regular on Eddie Cantor�s NBC broadcast (he also became posthumously famous for suffering a fatal heart attack at a Friar�s Club roast in 1958, when tablemate Milton Berle�s cries of �Is there a doctor in the house?� were misconstrued as shtick). As a sportswriter, Charles Einstein was, among other honors, a lifetime member of the Baseball Writers Association of America. His works include four Fireside Books of Baseball, The New Baseball Reader, and (with Willie Mays) Born to Play Ball and My Life In and Out of Baseball. 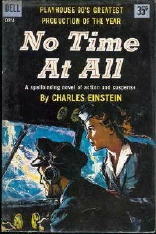 # No Time at All (n.) Simon & Schuster, hc, 1957. Dell, pb, 1958. # The Naked City (co) Dell First Editon A180, pbo, 1959. Stories based on TV scripts by Stirling Silliphant. # The Blackjack Hijack (n) Random House, 1976. Fawcett Crest, pb, no date. 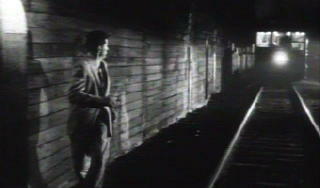 The Bloody Spur was made into the RKO movie While the City Sleeps, 1956, directed by Fritz Lang. A top-notch film noir / social criticism film about the role of the media (newspapers vs. TV) while a serial killer is on the loose, it sounds as though it should be on DVD but for some reason, it does not seem to be. The movie stars Dana Andrews, George Sanders, Ida Lupino, Vincent Price, Rhonda Fleming, Howard Duff, Thomas Mitchell and Sally Forrest. 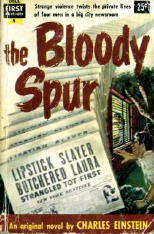 The Bloody Spur. ��Help me for gods sake.� Later the doctors would use these words to decipher the riddle of a perverted killer. Right now, the lipstick scrawl signaled the start of New York�s greatest manhunt. Charlie Einstein and I were fellow campers at Deer Lake Camp, Madison, Connecticut in 1938 and following years. When most of us arrived at camp, Charlie greeted us with, “Do you any of you guys play baseball?” He was 12 years old at the time! Our baseball was only softball but we had a great time. Charlie was a great guy and I regret that I was never able to contact him again. We said the same thing-‘do any of you guys play baseball?’ in 1940. I am writing a story about my time at Deer Lake. Would love to talk to you. It’s amazing how two people can be related and know so little about each other. He died when I was seven. I just remember my father(Jeffery Einstein, youngest son of Charles Einstein) sobbing into his hands, I just remember being extremely confused since I’d never seen him cry. I have great memories of sitting and playing the piano with him, while he sang of his walking stick. He also showed me his old type writer and I remember it being so foreign, I found it magical. Now I know where I got my love of baseball.